Chronic Wasting Disease, it’s here in Montana and hunters need to beware. Sadly, Mule deer and white-tailed deer hunters need to know their business when it comes to CWD. This fatal neurodegenerative disease is always fatal. 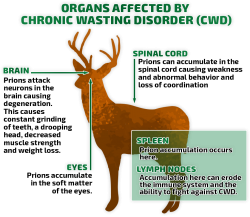 It seems that this terrible disease initially was spread from infected game farm deer. Montanans voted to eliminate Game Farms in 2000. Until a few seasons ago, Montana avoided this disease. It is now found in some wild game herds. Last year Carbon Co., near Billings, CWD was detected. It has now been found in Liberty County in north central Montana. Bordering states and Canada have also been infected. Cells called “prions” attack the animal’s nervous systems. These prions are spread through feces, urine, saliva and remains. Prions can stay dormant in nature for years. So far there is no evidence of humans being infected by CWD through animal transmission. Infected deer can look fine for months as the disease incubates slowly. Hunters that bagged infected deer this year saw no evidence of infection until the deer were tested. If you harvest a critter that is from an area where CWD has been found or tests positive, do not eat it! MTFWP will test the deer. Deer will display unusual behavioral changes and symptoms of wasting away. Nose to nose and fluid contact seem to be a common way to spread CWD. Therefore, baiting and feeding deer is against the law in Montana. Salt and mineral blocks also can spread the disease. There is also a connection to deer attractant scents, buck scrapes, and use of commercially sold urine hunting scents. These natural urine scents are collected from farm raised deer. They are currently legal, but a ban could be coming. Hunting rules may change as wildlife managers research, observe, and regulate the problem. Since bucks seem to be the most common affected, additional antlered hunts and quotas could increase. Lowering the buck- doe ratios could limit the spread. Targeting and culling specific deer may be necessary. Stay informed as smart and aware hunters. Check the FWP website for current, accurate, and up to date information. CWD along with Blue Tongue and other diseases can dramatically impact deer, big game, and antelope herds. Together we can limit these diseases impact. Be an aware, educated, healthy, and smart hunter!